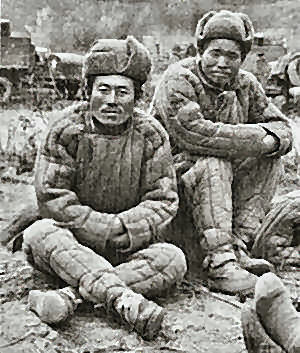 The ROK troops fought these battles in northeast Korea under great physical hardship from the cold. On 16 November the temperature in their zone already had dropped to 16�� below zero. Their uniforms in most cases consisted of one old suit of fatigues, worn-out shoes, one half blanket per man, and an old U.S. Army overcoat. 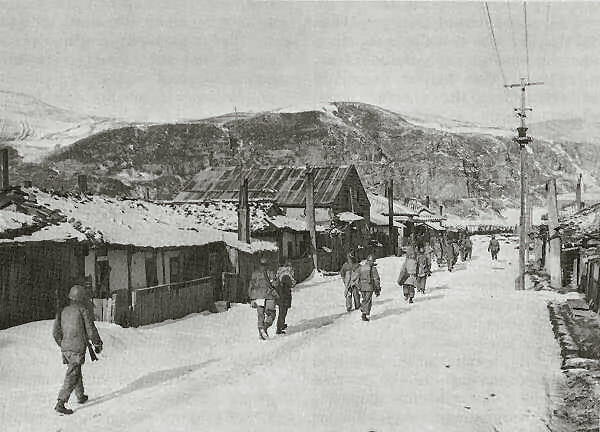 The situation was about to improve, however, for the next day at Songjin an LST unloaded 26,000 sets of ROK winter clothing. Another LST loaded with shoes, wool socks, underwear, shirts, and field jackets was to sail from Pusan that same day. In accordance with the corps order, the 17th Infantry prepared to attack across the Ungi River on 14 November. 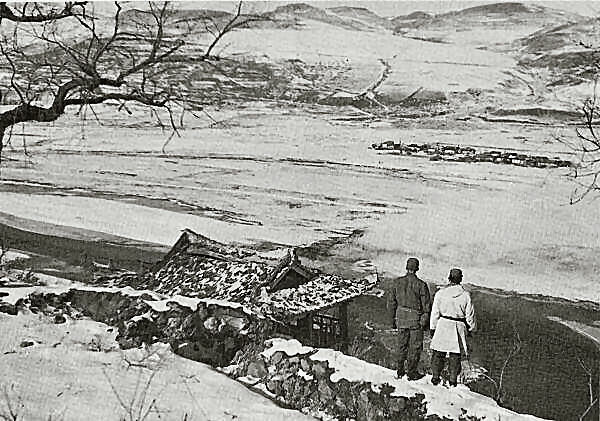 To replace the bridge which the North Koreans had blown, Colonel Powell had ROK troops in the regiment construct a floating footbridge made of planking extending between empty oil drums. Enemy fire on the bridge site was at long range and ineffective. The 2d Battalion, 17th Infantry, crossed over this footbridge without difficulty on the 14th and proceeded to the attack. The 3d Battalion was scheduled to cross the river at the same time over a shallow ford a few miles to the east. During the night of 13-14 November enemy forces apparently opened dams upstream. The water level rose two feet, making the river waist-deep. 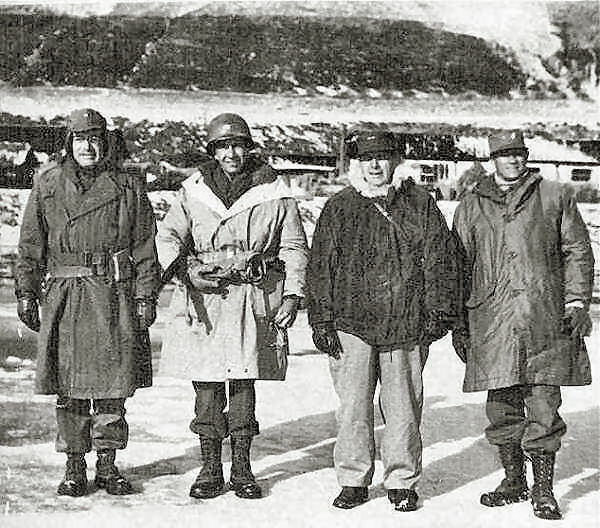 In the face of heavy small arms and some mortar fire, six men of L Company waded the stream in weather 7�� below zero. A few other men entered the water, but it soon became apparent that all who crossed the stream would be frozen and out of action in a few minutes unless they were specially cared for. The battalion commander ordered the men who had crossed to the north side to return. Their clothes had to be cut from them. They were then wrapped in blankets and taken to the 3d Battalion command post tent to warm. Casualties from this abortive crossing attempt were 1 killed, 6 wounded, and 18 men suffering frostbite from exposure in the river. Colonel Powell agreed with the battalion commander that the 3d Battalion could not cross by wading the icy water. Both Generals Barr and Almond concurred in this decision. The battalion subsequently crossed over the oil drum footbridge. The need for shelters and warming areas for the front-line troops led the 7th Division the next day to request the immediate delivery of 250 squad tents and 500 oil-burning stoves. In order to keep vehicle gasoline lines and carburetors from freezing it was necessary to mix alcohol or alcohol-base antifreeze with gasoline. ON THE BANKS OF THE YALU, two soldiers look across the valley into the mountains of Manchuria. 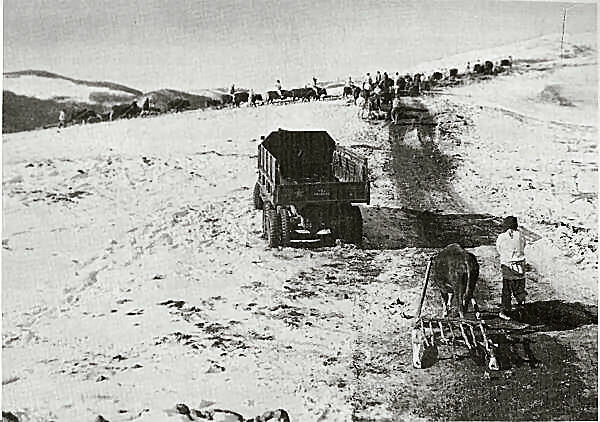 OX-DRAWN SLEDS replace trucks for the movement of supplies west of P'ungsan across the icy wastes. During November the U.S. 3d Infantry Division joined the X Corps in Korea. One of its regiments, the 65th, had been in South Korea for more than two months. It had embarked on two transports in Puerto Rico on 25 August, passed through the Panama Canal, and sailed directly for Korea. It arrived at Pusan on 22 September and disembarked the next day. The other two regiments, the 7th and 15th, and the division headquarters sailed from San Francisco between 30 August and 2 September. The last ship of the division transports arrived at its destination, Moji, Japan, on 16 September. During the marines' six days of battle with the Chinese 124th Division the 1st Marine Air Wing had inflicted great numbers of casualties on the Chinese. But according to prisoners, the supporting artillery and mortars had taken an even greater toll. After 7 November the CCF 124th Division reportedly was down to a strength of about 3,000 men. Except for its stragglers, the 124th Division did not again enter the fighting in the reservoir area. X Corps PIR 34, 30 Oct 50; X Corps WD, Summ, 28 Oct 50 and WD, 4 Nov 50, G-1 Rpt, Rpt on Almond-Partridge Conference. Like both AMS maps of Korea, scales 1:250,000 and 1:50,000, the text uses the Korean place names Pujon and Changjin for the two reservoirs that figure prominently in the narrative hereafter. Hagaru-ri is used for the combined areas of the town of Changjin and the village of Hagaru-ri. 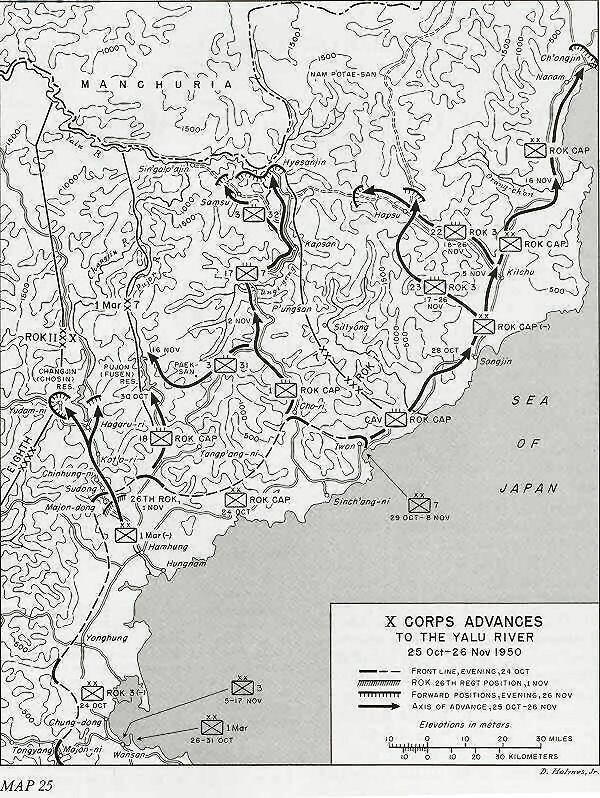 Because the American forces were using Japanese maps (some early maps gave dual names), they used the Japanese names Chosin and Fusen rather than the Korean Changjin and Pujon for the reservoirs. X Corps WD, Summ of Opns, 3-6 Nov 50; Ibid., PIR's 39, 4 Nov, 40, 5 Nov, and 41, 6 Nov 50. X Corps POR 50, 15 Nov, and 57, 22 Nov 50; X Corps PIR 49, 14 Nov, 51, 16 Nov, and 54, 19 Nov 50; X Corps WD, 25 Nov 50, app. 1, Intel Est to an. AO 7, p. 2; GHQ UNC, G-3 Opn Rpt, 14 Oct 50; EUSAK WD, 16 Nov 50, EUSAK Daily News Bull. X Corps POR's 52-55, 17-20 Nov 50. X Corps POR's 55-61, 20-26 Nov 50; X Corps PIR's 59-61 24-26 Nov 50; 2d Log Comd Hist Rpt, Water Div, Trans Sec, Nov 50. 7th Inf Div WD, 29-31 Oct 50; X Corps POR 36, 1 Nov 50. 7th Inf Div WD, 1-2 Nov 50; 17th Inf WD, 1-2 Nov 50; Interv, author with Brig Gen Herbert B. Powell, 13 Apr 54. 7th Inf Div WD, G-4 Jnl, 4-5 Nov 50; Ibid., 5-7 Nov 50; Barr Notes, 6-7 Nov 50. 17th Inf WD, 14 Nov 50; 7th Div WD, 14 Nov 50 Barr Notes, 14-15 Nov 50; Interv, author with Powell, 13 Apr 54; Interv, author with Lt Col Walter Gunthorp (2d Bn, 17th Inf, Nov 50), 13 Apr 54. 7th Div WD, 15-19 Nov 50; Barr Notes, 19 Nov 50; Capt George H. Worf, "Enroute to the Yalu," Antiaircraft Journal (March-April, 1951), p. 22. 17th Inf WD, 21 Nov 50; 7th Inf Div WD, 20-21 Nov 50; X Corps WD, Diary of CG, 21 Nov 50, X Corps POR 55-56, 20-21 Nov 50; X Corps PIR 56, 21 Nov 50; Barr Notes, 21 Nov 50. Schnabel, FEC, GHQ Support and Participation in the Korean War, ch. VII, p. 2, quoting Msg U/CX2867, CG X Corps to CG 7th Div, 21 Nov 50, and Msg U/CX2859, CG X Corps to CG 7th Div, 22 Nov 50. Interv, author with Almond, 23 Nov 54; Interv, author with Barr, 1 Feb 54; Interv, author with Powell, 13 Apr 54. 7th Div WD, 22 Nov 50; X Corps PIR 57, 22 No 50; 1st Lt Martin Blumenson, Task Force Kingston (32d Infantry Regiment, 22-29 November 50), copy in OCMH. X Corps PIR 59, 24 Nov 50; 7th Div WD, 22-28 Nov 50; Senate MacArthur Hearings, pt. 4, p. 2954, testimony of Gen Barr. EUSAK WD, G-1 Hist Rpt, 15 Sep 50; 3d Div Comd Rpt, Nov 50, sec. 1, p. 1: Maj. James A. Huston, Time and Space, ch. IV, p. 117, MS in OCMH; ORO, Utilization of Indigenous Manpower in Korea, ORO (FEC), pp. 54-56. 3d Div Comd Rpt, Nov 50, sec. III, p. 3; Ibid., G-3 Jnl, entry 1225, 10 Nov 50; X Corps POR 52, 17 Nov 50; X Corps PIR 46, 11 Nov 50; 2d Log Comd Hist Rpt, G-3 and G-4 Secs., Nov 50; MS review comments, Col John H. Chiles to author, Nov 54. 3d Div Comd Rpt, Nov 50, sec. III, p. 4; X Corps Opn Ord 6, 11 Nov 50. 1st Mar Div SAR, Oct-Dec 50, vol. II, an. C, 1-2 Nov, pp. 14-16 Ibid., vol. III, an. RR, 2 Nov, p. 12; X Corps POR 34, 30 Oct 50. 1st Mar Div SAR, Oct-Dec 50, vol. III, p. 12, an. RR, 2 Nov 50; X Corps WD, 2 Nov 50, Msg at 1730 from Maj Sayre; X Corps PIR 37, 2 Nov 50; Lynn Montross and Capt. Nicholas A. Canzona, USMC, U.S. Marine Operations in Korea, 1950-1953, vol. III, The Chosin Reservoir Campaign (Washington: Historical Branch, G-3, Headquarters, U.S. Marine Corps, 1954), is an excellent detailed account of the 1st Marine Division in northeast Korea in 1950. 1st Mar Div SAR, Oct-Dec 50, vol. 11, p. 19, an. C, 3 Nov 50; X Corps WD, PIR 39, 4 Nov 50: Geer, The New Breed, pp. 234-36: Montross and Canzona, The Chosin Reservoir Campaign, pp. 103-109. 1st Mar Div SAR, vol. II, pp. 23-25, an. C, 5 Nov 50; X Corps PIR's 40-41, 5-6 Nov 50; Geer, The New Breed, pp. 239-41. 1st Mar Div SAR, vol. II, pp. 27-28, an. C, 7 Nov 50; ATIS Interrog Rpts (Enemy Forces), Issue 19, Nr 2400, p. 1, Wang Fu Tien, 372d Regt, 124th Div. X Corps WD, 4 Nov 50, G-1 Rpt, Notes on Conference between CC X Corps and Gen Partridge, 4 Nov 50; USAF Hist Study 71, pp. 76-78. 1st Mar Div SAR, Oct-Dec 50, vol. III, p. 79, an. RR, app. 3, Cold Weather Rpt, and p. 95, app. H, Medical Rpt. 1st Lt. William J. Davis, "Lessons Learned Up North," Marine Corps Gazette (April, 1952), p. 45. Senate MacArthur Hearings, pt. I, p. 246, testimony of MacArthur, and pt. 2, pp. 972-75, testimony of Bradley. EUSAK WD, G-3 Jnl, Msg 1700, 25 Oct 50; Interv, author with Col LeRoy Lutes, Jr. (Planning Off G-3, X Corps, 1950), 7 Oct 51; Interv, author with Maj Gen Frank A. Allen, Jr., 28 Jan 54. EUSAK WD, G-3 Jnl, Msg at 1335 6 Nov, G-3 Sec, 7 Nov 50, and Br for CG, 10 Nov 50. Songsin-ni does not appear on the 1:250,000 revised map of Korea, but the village of Yakhyon-dong is at the map co-ordinates given in the records for Songsin-ni. X Corps WD, Summ, 10 Nov 50; Ibid., Diary of CG; 65th Inf Comd Rpt, Nov 50, p. 5; Interv, author with Almond, 23 Nov 54. 2d Inf Div WD, Narr Summ, Nov 50; Rd Inf Div POR's 300, 13 Nov 50, and 303, 14 Nov 50; IX Corps WD, bk. I, sec. IV, Opns, Nov 50; 3d Inf Div WD, G-3 Jnl, 13 Nov 50; EUSAK WD, Br for CG, 13 and 16 Nov 50; 38th Inf WD, 12-18 Nov 50. 3d Inf Div WD, G-3 Jnl, Msg CG X Corps to Eighth Army, 1500, and entries at 1020, 2220 13 Nov 50; Ibid., G-3 Jnl entry at 141330 Nov 50: X Corps PIR 49, 14 Nov 50; 65th Inf Comd Rpt, Nov 50, p. 4; EUSAK POR 379, 15 Nov 50; EUSAK WD, G-3 Sec, 14 Nov 50; Lt. Col. Robert C. Cameron, "The Lost Corps," Military Review, vol. XXXIII, No. 2 (May, 1953), p. 11. Cameron was B-MAC adviser to the 10th Regt, ROK 8th Div.